Located just east of Interstate 205 and north of Fourth Plain Blvd., the Orchards neighborhood is just a few minutes away from the Portland International Airport, around 20 minutes to downtown Portland, and 15 minutes to downtown Vancouver. And while the western part of Orchards still has some city amenities – Vancouver Mall is nearby, a Kaiser medical facility and major thoroughfares including Padden parkway – farther east provides a little more breathing room. Homes range from $500,000 with some acreage, including new builds or existing homes, all the way to fixer uppers coming in at under $200,000. The Orchards neighborhood is in the Evergreen School District and students attend Heritage High School, Covington Middle School, and York, Sifton and Orchards elementary schools. Heritage High offers Advanced Placement classes as well as a Running Start option. 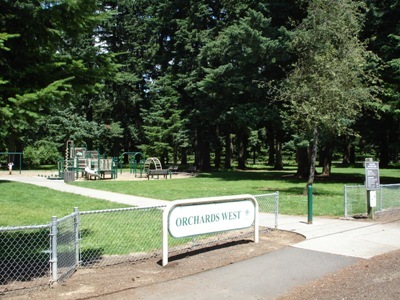 Orchards Community Park, located where Fourth Plain and I-205 meet, is 33 acres of family fun! There are two picnic shelters, three barbecue grills, a restroom, and 22 picnic tables for summer lunches. Activities abound with eight different play structures, three horseshoe pits and plenty of open lawn areas and walking trails. Orchards Highlands Park is located on the Northwestern part of Orchards and features almost heavily wooded acres. There are three pieces of play equipment and four benches for a more easy going park experience.